Car accidents occur every single day, and many of these accidents result in injuries. These injuries can be extremely devastating, especially if they are injuries to the back and spine. Back injuries often result in long-term health problems, sometimes even permanent disabilities. Recovery can be both expensive and emotionally traumatic as you adjust to new physical limitations. If this has happened to you, call our office to speak with a Salt Lake City car accident back injury lawyer immediately. Your family should not have to suffer financially due to medical bills and lost wages, particularly if someone else’s negligence caused the accident. Any one of these injuries can be life changing and create substantial financial burden. If another driver was at fault for the accident, you can seek financial compensation by filing a personal injury lawsuit with the help of a qualified Salt Lake City car accident back injury lawyer. Before accepting a settlement, you should fully assess both the extent of your injuries and the expenses and losses that have resulted from them. Many back injuries have long recovery times and some may be permanent. Your settlement amount needs to factor this in, as well as any medical expenses, cost of rehabilitative and mobility equipment, modifications to your home and vehicle in order to accommodate the injury, and any lost wages due to time off from work. In Utah, you only have four years to file your lawsuit before the statute of limitations is reached. If you wait too long to file, the other driver could request the case be thrown out before a verdict is even rendered. It can take time to gather the evidence necessary for a strong case. Hiring a Salt Lake City car accident back injury lawyer from our law firm right away gives us time to make certain nothing is overlooked and ensures you don’t miss your window of opportunity for financial compensation. Because Utah uses comparative negligence laws, it will be necessary to demonstrate the other driver was either completely or mostly to blame for your accident. After hearing the evidence, the court will assign each driver a percentage of responsibility for the accident. Any amount you are found at fault for will directly reduce your settlement by that percentage. This makes it imperative to have an experienced attorney on your side in order to mitigate the amount of liability assigned to you as much as possible. We see a number of common back injuries that occur in car accidents and are intimately familiar with the time, cost, and effort needed to recover from this kind of injury. 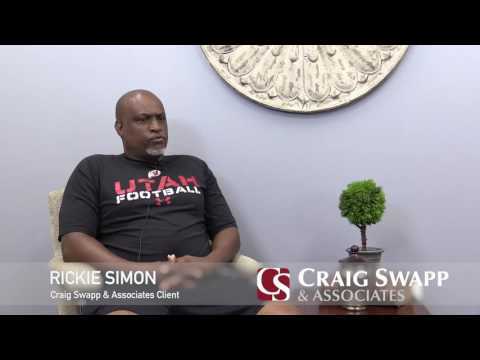 Craig Swapp & Associates is well-equipped to represent you and pursue your claim. To discuss your case and your options in further detail with a Salt Lake City car accident back injury lawyer, call 1-800-404-9000 or contact us online through the form below.